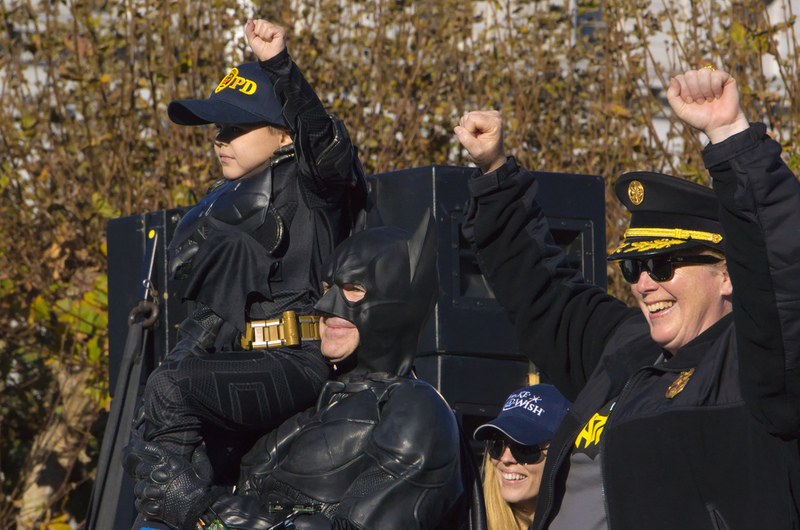 Batkid is feted in San Francisco. Twelve thousand people collaborate in making a wish come true for one child. Uplifting videos go viral on websites. These seem like positive happenings, but they come with a dark side. Martin Luther King Jr., who can’t be accused of being selfish, once noted in a sermon that we all have a “drum-major instinct—a desire to be out front, a desire to lead the parade, a desire to be first.” It’s human nature to want recognition. Sometimes this selfishness is naked: I try to beat you so I can succeed. Sometimes it’s hidden: King noted that some people are always joining some social group or reform movement, ostensibly to help others in some way, but really because they can’t be comfortable being by themselves. Almost two centuries ago, Ralph Waldo Emerson noted that the average American walked around with a new proposed Constitution in his pocket. Reformers were all over the place; they were convinced they could change the world. And yet, Emerson observed, they paid no attention to their own souls, to their own private unhappiness, to being better connected to the actual world around them as opposed to the abstract universes in their minds. Emerson and King could never have imagined such human traits unleashed in today’s networked world of immediate and almost infinite interaction. You can join as many groups as you like with the click of a button. You can help as many causes as your broadband will allow. We post moment-to-moment thoughts on Twitter; we write daily posts on Facebook about activities that used to be summed up once a year, if at all, in holiday letters. (This year, Jimmy made the soccer team and scored three goals! Sally has improved her flute skills. Jack was promoted to executive vice president at his firm.) If words are difficult for you, you can pass along the daily moments in pictures on Instagram. These are obviously self-centered activities, which is why teenagers (no offense, I was once one) love them especially. But what about Batkid? And Twitter in the Arab Spring? And flash mob marriage proposals? These are good and unselfish acts, you might think. They are, but even unselfish acts can be done selfishly, as King described. You feel the entire world ought to know you’ve proposed marriage. Your innermost thoughts need to be expounded to the universe. Our internal dialogue is outside, all the time. Yet another great thinker, Blaise Pascal, once said that most problems in the world come from the inability to sit still in a room. We’re lonely; we’re bored; and so we go looking for stimulation, and frequently enough, we get trouble. We are more self-obsessed, but paradoxically, we let the entire world know about it. It’s another-centered self-obsession. We spend hours on Facebook and meet our friends less and less frequently in person. In the 1950s, the writer H. L. Mencken, nearing the end of his life, bought a telephone. He couldn’t quite adjust to it. It bothered him that anyone could call his home at anytime and expect that he should stop whatever he was doing to speak on the phone. Mencken much preferred the world before telephones and television. You sat quietly in your home; if someone wanted to see you and they lived nearby, they came to your door and knocked. You wrote letters to those who lived farther away. Nothing was instantaneous. You thought before you met or wrote or spoke. The Internet is here to stay, of course. E-mails have certainly broadened our ability to communicate, especially at long distances, in a way letters never could. Mobile phones have expanded our ability to connect. And social media allows for group connections that go far beyond what used to be achievable by in-person group meetings. But what we are losing is a sense of boundaries. No one is stopped by a door or even a telephone. And so, the drum-major instinct takes over, and the wish to avoid knowing ourselves, and our real world, finds a new outlet. We flee reality more and more easily, by losing ourselves in a virtual world without limits. Nassir Ghaemi is the author of On Depression and A First-Rate Madness. He is a professor of psychiatry and pharmacology at Tufts Medical Center in Boston, where he directs the Mood Disorders Program. *Photo courtesy of Eric Wagner.